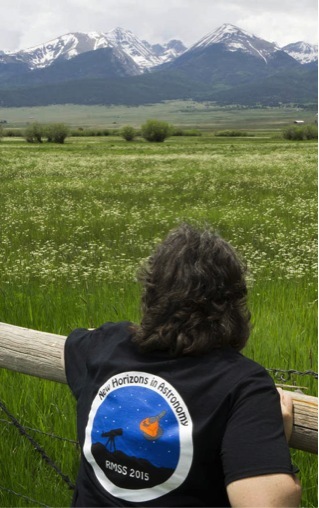 I admit that I love giving presentations on New Horizons to public audiences. It’s the killer combination of Pluto and space exploration. Everyone digs it. The best are astronomy clubs—just bursting with enthusiasm. And my favorite group of all time is the Rocky Mountain Star Stare (RMSS). Based in Colorado Springs, RMSS meets every year on a piece of land close to the Colorado–New Mexico border that is far from city lights. The trek is worth it—the Milky Way blazes across the sky. And these guys have brought along the most amazing astro-geek equipment. But they also want to hear the latest news from those of us who are lucky enough to make a living doing space science. So, for the second year in a row, I accepted the invitation to pack up the truck to camp out for the weekend. Pragmatism rules with these guys. Facilities are basic but work just fine. A storage shed seats 50 people on camping chairs to watch a presentation. True, a passing rainstorm can seriously disrupt communication, but dealing with nature is part of the game. Once the hammering on the tin roof abates, the questions return to the “whats,” “hows,” and “whys” of New Horizons’ exploration of Pluto and the Kuiper Belt. Astronomy clubs can be humbling. They really know the night sky. After questions dwindle and the clouds clear everyone is itching to look at the night sky. Careful to use a red flashlight, we wander around the grassy meadows, visiting clusters of astronomers who have set up their telescopes and invite anyone to look at what’s there to see. I’ve seen hours-old images from NASA planetary missions and marveled at the wonders from the Hubble Space Telescope. But there is really nothing so visceral as standing atop a 15-foot ladder and controlling, by hand, a 25-inch diameter Dobson telescope, hopping from galaxy to open cluster to nebula across the sky. And in the direction of the Milky Way, to great frustration of the New Horizons team looking for a follow-on Kuiper Belt target, there’s Pluto. Last year, RMSS organizer Hal Bidlack, focused his telescope on Pluto. It’s bizarre to realize I have been working on a mission to Pluto for the past 26 years—but it’s utterly mind-boggling to have photons hit my eye that had left the Sun nine hours before, traveled 33 AU out to Pluto and then traveled 32 AU back to be gathered by a telescope in Colorado. The beauty of such clubs is their sheer inclusiveness. No one cares what you do during the day, it just matters that you’re curious and want to look up at the sky at night. Sure, astronomers can geek out about technical specifications of the optics of their telescopes or cameras. But anyone, young or old, expert or novice, is invited to look through the eyepiece and see the wonders of the universe. And not just at night. After a breakfast cooked by the local scout troop, out come the solar telescopes, with filters to reveal filaments on the disk turning to prominences off the limb. But my biggest grin is watching the kids playing with dry ice—making balloons sink not rise—and seeing liquid nitrogen bubbling in a glass jar. During daytime hands-on programs they learn about sublimation, condensation, and frost. The very stuff happening on the surface of Pluto. At the end of every talk I always get asked, “Why haven’t spacecraft landed on the surface of Pluto?” Perhaps these kids will make that happen some day.